Below are some suggestions that we can mix and match to suit your occasion. Please email or ring us for more information or to make an order. 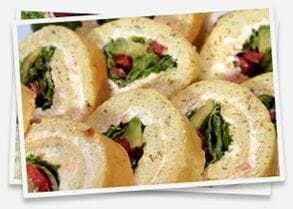 We pride ourselves in offering an affordable and professional catering service, representing good value and consistency in both menu and all areas of delivery and service. We cater for all aspects of corporate catering from morning teas, working lunches, client cocktail parties, finger food catering, staff birthday shouts. We understand the diversity and fast pace of our modern day business and reflect this in our menu offerings to include healthy nutritional and well balanced offerings. We are also approachable we listen to your requests and adapt our offerings to suit the requirements of your business. Our reaction time is second to none; we have a professional kitchen that can produce all catering menus.